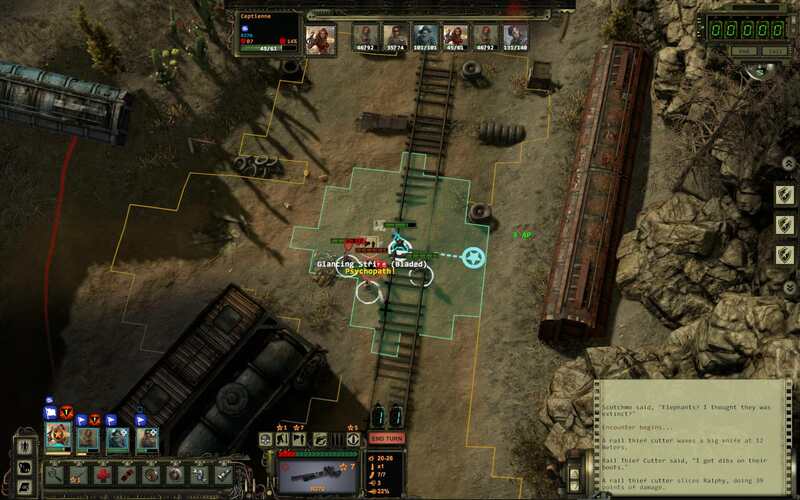 Wasteland 2: now with improved modding capabilities! 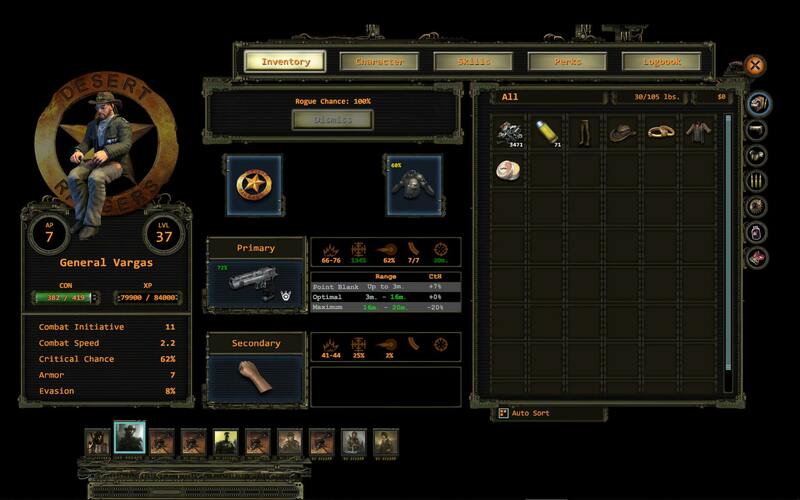 Re: Wasteland 2: now with improved modding capabilities! Thanks a lot for your effort! How do you think when 0.9.5 will be available for beta-testing? Not sure. Hopefully in a couple months. Major tasks still on my todo list are item durabilities and an ammo 'quality' system. I also need to make sure Leadership is working fine for NPCs, and do a rebalance pass on Attributes as Awareness is too critical right now. Hey there! Nice to see you back. i wonder if you are planing to make a clip system, like one we was talking about before? Going further with hard coding (I think it will be super-duper hard to make) you can make some weapons use not raw ammo but "clip" or "cartridge belt" for heavy weapons. So first you need to find "clips", then manually put ammo in it. For example, reload clip costs 2 AP, but put 1 ammo in clip costs 1 AP. So if you only have 1 clip with 10 bullets, and you empty it, you'll spend 1-10 AP, to load 1-10 ammo and +2 to load it in to your weapon in combat. But if you have 2-3 clips, you can switch them with 2 AP. I think this will require adding new ItemTemplateType - "Clip". DerivedStatEnum - ActionPointCost_LoadClip and tons of coding and bugfixing, and ui tweaks. Definitely not for 0.9.5. I've already got a lot on my plate and don't want to delay 0.9.5 any further. Implementing a clip system will entail extensive UI changes, and that always drags on longer than I'd like. Hi Executor, as you might know I've published limited version of my mod(without Prison main quest changes)on Nexus, and Steam users have issues with file name too long error. Creating symbolic link does not always solves the problem. You still have to manually delete some folders.(e.g. C:/Program Files (x86)/Steam/steamapps/common/Wasteland 2 Director's Cut/Build/WL2_Data/Mods/Import/LosAngeles\CA01_WattsTowers\Interactable\Drama\PropObject\InteractableObject\InteractableInventoryObject\InventoryObject_Sturdy\PassphraseInventoryObject_Sturdy'). Is there some solution other than creating symbolic link or manually deleting long folders? Never mind , I think I'll just recommend everyone to use custom folder - that should do the trick. Whenever 0.9.5 is finally finished, I'll have the mods folder location default to "C:/Wasteland 2" or the like because "C:/Program Files (x86)/Steam/steamapps/common/Wasteland 2 Director's Cut/Build/WL2_Data/" wastes a third of the character limit. Am I doing something wrong or is it not possible at all? There's a bunch of DerivedStats that intentionally do not get any target Situations when being calculated. The value of actionPointCost_Attack can't vary based on target because on your characters' turns, the map tiles are colored green or yellow based on how far they can move and still attack. This requires that every target costs the same amount of AP to attack. Weapon ranges (pointBlankRange, optimalRange, attackRange) similarly ignore target Situations because it would cause UI issues. Hi Executor, either I am doing something something wrong or I've found a bug. I was trying to implement a camouflage mod. As a model I took Taunt trait but instead of "Situation.UnderLeader, Situation.Target_Hostile" I used "Situation.Target_RangedWeapon, Situation.Target_Hostile" condition. To test it I gave ridiculosly high penalties to the enemy's CtH but enemies have no problem hiting me, I however have 0% chance to hit. Please see my mson below. grammaticalName : "<@>(a/[COUNT]) gun sling(/s)"
description :"<@>Makes you hard to notice"
Situation.UnderLeader is special; normally you can't affect enemy chanceToHit directly. However, you can raise the PC's evasion using chanceToEvade. 1. Is there some way to increase lethality of dehydratation? 2. Will something like this work for the armor (protect only one ranger that wears this armor from incoming ranged damage)? No, that would just lower the damage output of the character wearing the armor. You could try raising the 'armor' stat instead, which, depending on the attacker's armor penetration, would lower the damage taken. New update! Thank you man, keep on going! Error [Line 44 at 'AICompou...derer'] Could not find a class named 'AICompoundAction_NPCWanderer'. Class Types are case-sensitive." Game loads without issues so it does not really bother me, but maybe you'd like to know about it. I think I fixed that for 0.9.5. It's not really an issue in 0.9.4 either though, as the field will remain unchanged if there is an error. If you want to remove the error message from showing up in debug_import.txt, just delete that idleAI line from the override MSON. The override file only needs to include the fields that you are actually changing, otherwise you're just slowing down the map loading process slightly. Hi Executor_, first of all let me thank you for your outstanding work here! I really appreciate it. I thought I'd list a few bugs that I've come across playing your most recent 0.9.4v build, I hope that's helpful. When the Slayer perk activates on a Ranger that still has to close the distance to the target, combat gets stuck - the Ranger never moves, and it's impossible to do anything else except quit combat. Combat music: In Arizona it's very often the case that the combat music only stops after I have visited the inventory screen of a character (after combat has concluded). Then it usually starts to fade. In California it's the same, but in addition I also have to visit inventory to get the combat music started. Scotchmo only steals Squeezins from the 4 original Rangers, never from the other companions. Arguably a feature and not a bug, but it does seem inconsistent at the very least. When entering the Titan of Canyon, Jill and her crew turned hostile after a botched surgery. Her cows then also turn hostile. So far, so intended, but I also had brought along a cow as an animal companion for Vulture's Cry. This cow also turned hostile. After combat the cow still followed Vulture's Cry around, and the Cattle Drive bonus was still received, but the cow remained hostile. If Vulture's Cry was positioned next to the cow during subsequent combats, she always received the Under Pressure penalty. It was also impossible to talk to the cow, to praise/rename/release her. I'll look into properly fixing the AZ5_Jill/AZ5_Howdy Dramas turning animal companions hostile for 0.9.5. For now, the above workaround should suffice. Although I wouldn't mind you sending me a savegame with the hostile cow just to confirm the workaround functions properly. Stealing from any other party member is one of the changes I've already made to CNPC stealing for 0.9.5, along with a few other adjustments. 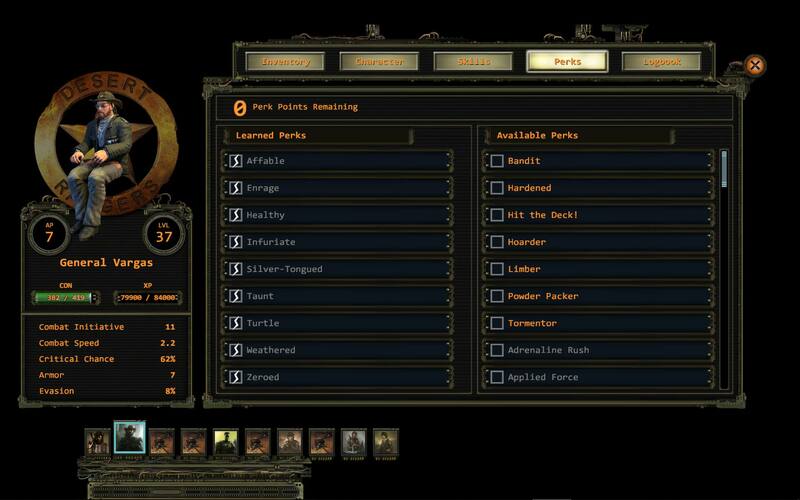 Hello all, I'm trying to remove the level cap (In Wasteland 2 Director's cut) and have leveling either go on forever or be so high I couldn't reach it in a lifetime. I think I found a leveling table but it seems that the experience required for each level was manually set in the code and not calculated by some equation. Is there a way to maybe use something like Microsoft excel to keep adding on to the table until level 15000 or something? Or maybe a way to add an equation to calculate levels? I have no modding or excel experience. All of my attempts at trying to copy and paste an extended table from Microsoft excel into the wasteland 2 directors cut leveling table have broken the formatting. I would try to add more details to this post but I'm currently out at the moment so as soon as I get back home I'll try and give more info.